there are 30 king tier players (top ranking players from ASL) so those are the key players when making a team since there is a limited pool. That looks like a fun team to be in. I hope Tyson gets a win this time. I mean he did actually beat Flash in the ASL team battle.. But going winless last starbjmatch, I felt kinda bad for him standing there during the trophy ceremony. Do you know all the team lineups? Looking forward to this! That is so cool... thanks CadenZie and GL HF for the tourney! Is that Flash and Jaedong in one team? What? I gotta catch this. is the tournament fully offline? what will the map pool for this ? looks interesting, and 12 teams is a lot! Really nice to see HAY superstar, nOOB, playing. Wish him all the best. I wish this league has 12 teams instead of 8 teams. I voted for Nada and Stork team. Wait, Canata is playing again? Nice looking tourney, should be fun. I'm afraid he has not joined in any team this time. anyway the votes are in and all you guys let me down so we wont get one of the group leader seeds, be ashamed of yourselves. top 2 teams get a nice comfy seed for the bracket selection, teams 3 to 6 get to bypass the wildcard, and teams 7-12 have to go through the grueling gauntlet of the wildcard tournament on sunday. only two teams can advance from the wildcard tournament to join the rest of us in the main tournament. teams are split into 2 groups 7thplace, 10th place and 11th place in group A, and 8th, 9th and 12th in group B.
interestingly this time there is the return of team melee (that was in season 1 last year) except this time its 3 progamers on each team~ so it should be pretty incredible to watch. 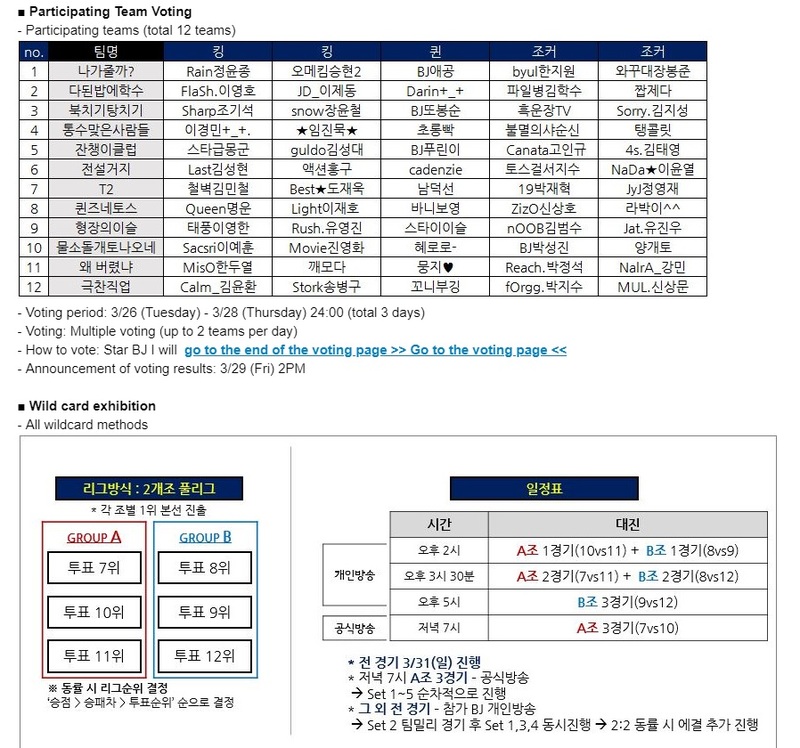 for example, the top voted team could be flash, jaedong and soma playing as a team in team melee. rip, who is replacing tyson?